That line still cracks me up, but could it be more true? In the midst of teen angst when I was trying to be oh-so-perfect, a friend's mom said to that to me one day and I have never forgotten it. We live in this time of cropped pictures and filtered images where we have more access to each other's lives than ever before, but have never had a less accurate view. You get to see what I want you to see and I get to see what you want me to see, but neither of us can see the full picture. In the game of comparison, I measure my reality against your highlight reel and end up frustrated. We beat ourselves up for never quite getting it right, never measuring up, never reaching that peak of perfection we long for. Not only can we not reach it, our children can't reach it either. We were never meant to. And yet, we continue to wake up each day and set those expectations for ourselves and for them. As a result, we are a discontented people. If we are pleased with our weight, we are not pleased with our house. If we are pleased with our house, we are not pleased with our car. If we are pleased with our car, we are not pleased with our clothes. There's always something more to strive for. Self-improvement is nice and all, but won't we find all those things and more if our focus is on Christ? If we crave Him more than any food, freely offer the hope we find in Him more than anything we are selling, find security in His presence and peace in His provision, won't we be more satisfied than we could ever be otherwise? "But godliness with contentment is great gain, for we brought nothing into the world, and we cannot take anything out of the world." It's so cliche these days to say that only one person lived a perfect life, but it's still true. Christ alone. If we have such longing to be perfect, why are we not turning to the only success story there ever was? The most talented people you know are not the most talented in every area, usually one or two at most. We cannot do a million things to the glory of God. (Boy, could I tell you stories about that futile pursuit!) WonderWoman is a fictitious character for a reason. That kind of power rests in God alone. We have access to Him, but we are not Him. We were never meant to be. I don't know about you, but I forget that all the time. I lose perspective and blow all the wrong things out of proportion. 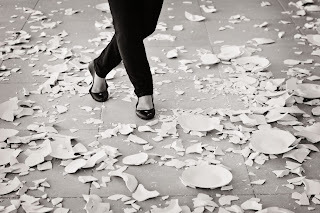 If I am not careful, I will fixate on the "wrecked" areas of my life and lose sight of all that is good. I will try so hard to mend what is broken all by myself that I'll fail to remember the One who has brought healing every single time I've known it before. Have you ever sat across from a person who was quick to tell you how successful they are? Listened as they boasted of all the wrong they've never done and all the right they do every day? Does that do anything to encourage anybody? Of course not. You both leave there feeling smaller somehow and nobody is better for having been together at all. Now, let me ask you something else. Have you ever sat across from a person so burdened with their current situation they couldn't deal and let your guard down? Have you listened to all that is wrong and then had the opportunity to share when your life was broken in a similar way? Have you had the chance to encourage them by telling them how those things worked out in the end? Have you seen the weight fall from their shoulders until it was visible? Watched as hope returned to their eyes? Isn't that so much more life-giving than complaining over what is wrong or boasting over what is right? That's what love does. Why don't we do more of that? We are taught from childhood not to judge a book by its cover, but we do it all the time. In a new situation, we do a quick scan of the room and if the folks across the room look all put together, then we believe they are. We keep focusing on ourselves and trying so hard to measure up to some make-believe expectation that we miss opportunity after opportunity to strengthen our brothers and sisters with the strength we have been given. We fail to love the ones who are silently longing to be seen with the love we have been given. We talk too much to listen to the ones who so desperately need to be heard. We never stop at all to ponder who could really use what we have or to consider that maybe they are the reason we have it in the first place. We may get a lot of things wrong at our little church, but one thing we strive to do is to love each other and our community well. We are desperate to remind the world that God is not against them. He is for them and so is His church. We just kind of have this hunch that programs can only teach you so much, worldly pursuits can only take you so far, and people can only pretend for so long. We are determined to say no to anything that doesn't point toward Jesus and the simple example He set. Not one of us gets it right every time. No one in the whole crew is perfect or qualified to lead someone by perfect example, but the beautiful, breathtaking thing is that no one is pretending to be. We are all just desperate for a hope that lasts, a faith that carries us through uncertainty, a peace that surpasses all understanding. We believe His name is Jesus. Most of us have tried, at one point or another, to find all those things elsewhere and failed miserably. That reality only makes us more grateful for the grace of God and more willing to extend it to the next person who walks through the door. That kind of love and transparency can be uncomfortable for those accustomed to hiding and pretending, but it's life changing for the ones longing for more. "Therefore, if anyone is in Christ, he is a new creation. The old has passed away; behold, the new has come. For our sake he made him to be sin who knew no sin, so that in him we might become the righteousness of God." Christ alone can make us new. Christ alone can see all the cluttered corners we crop out. Christ alone steps into our messes and embraces us in the midst of them. Christ alone sees every blemish and wrinkle we try to hide and knows the story behind each one. Christ alone is capable of writing a better story for our lives. What if we woke each day with the expectation of seeking more of Him alone? What if our goal was to be more like Jesus tomorrow than we were yesterday? What if we set those same kinds of goals for our kids? What if we realized how we have complicated the simple? How different would our homes be? How different would our world be? What if we stopped reaching for the world's impossible standards and reached for the God who makes all things possible? What if we stopped surveying the room and surveyed our own hearts? What if we found our true identity in Him and looked for His approval alone? The question is: what kind of wrecked do we want to be? Following Jesus will flip our world on its head. In God's economy, the first will be last and the last will be first. Leaders serve and servants lead. The least become the greatest. To walk in faith is to become a living paradox. Believing the same old lies and following the same worn path of former generations will produce the same results, or "wrecks" if you will, that we have tried to avoid. If we ever expect to see the cycle broken, if ever the family tree is going to change, it will have to begin with us. Only Love is strong enough to break some chains. Only Love can look upon the wrecked areas of our lives and declare them good. Only Love can mend what is broken and call it whole. Only Love would become broken to make it so. At the end of the day, that's the kind of wrecked I want to be. I’m thankful when people are willing to be vulnerable with each other as people at your church seem to be. We need more of that in the Church!